You may recognise the theme of this game from its 3-reel predecessor, of almost the same name. Well, here at Boku Slots we get excited when a game is reinvented and are always eager to see what new additions have been put in place. So, without further ado we bring you Microgaming’s, Break Da Bank Again and we hope it is going to live up to our expectations. 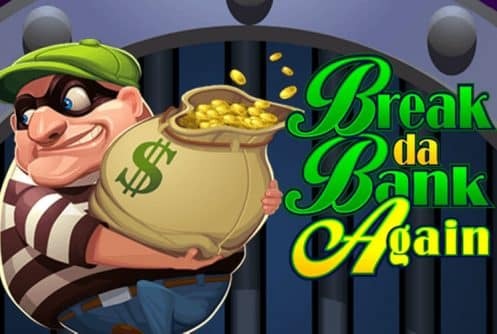 Break Da Bank Again is a 5-reel, 9 pay line slot offering an RTP of 95.43% for its players. Whilst this may seem on the lower side for a Microgaming slot, we are sure the features will make up for it. You can probably already guess what the theme is about, yep a bank robbery. So expect to see images of bundles of cash, gold coins and diamonds. Bet Amounts – Betting on Break Da Bank Again can begin from as little as 9p for all 9 lines in play, or up to £9 for all lines in play. Adjust your lines, coin amount and coin level to tailor your bet before each spin. This is certainly one of the more affordable slot games you will find around. Wild Symbol – The Break Da Bank Again logo doubles as your wild and will substitute for all other symbols except of course the scatter. All wins created with your wild will award a 5x multiplier during the base game and a 25x multiplier in the bonus spins feature. Scatter Symbols – A bank vault door is your scatter symbol, so land 2 of these on the reels to double your win. Land 3 or more to trigger the bonus spins feature as well. All wins made during the feature have a 5x multiplier on them. For every vault door that lands during the bonus, an additional spin will be awarded. Also, during the bonus spins if you complete a win with the wild symbol, it awards a 25x multiplier on that win. Gamble Feature – You will often find this feature in slot games and it gives the chance to double or quadruple your win. Select the gamble option after you win and you will be given the choice of predicting either the colour of the card, or the suit of the card. If you choose correctly you win either double or quadruple your money. However, guess incorrectly and you lose it all, so be very sure this is what you want to do when choosing this option. We told you the features would outweigh the low RTP didn’t we? Although simplistic in design and in play the chance of big wins here is high, with the amazing multipliers that have been added to the wild symbols. The fact that the bonus spins can’t be retriggered was a bit of let-down, however they seem to trigger often enough that it isn’t a huge issue for us overall. Break Da Bank Again is an exciting game to play and even the music in the background wasn’t too overwhelming, so it remained on for the duration of our play.